Quinoa is an excellent gluten-free source of protein, calcium, iron, B-vitamins and fiber. Rinse well before cooking because it has a coating of saponin resin that gives it a bitter taste. ¼ teaspoon salt for 1 cup of grain, optional syrup, chopped fresh or dried fruit and nuts. 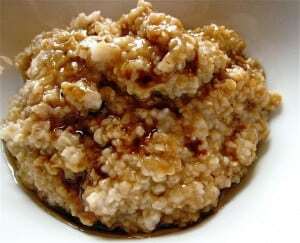 Cook quinoa in water for about 10-12 minutes until water is absorbed. Fluff with a fork and store in the refrigerator up to 5 days. For a savory taste, add minced herbs such as mint, chives, coriander or parsley, spices, sprouts, and chopped vegetables. For a sweet flavor, you might add maple.